The Aleppo Codex: A thriller? In an age when physical books matter less and less, here is a thrilling story about a book that meant everything. This true-life detective story unveils the journey of a sacred text—the tenth-century annotated bible known as the Aleppo Codex—from its hiding place in a Syrian synagogue to the newly founded state of Israel. 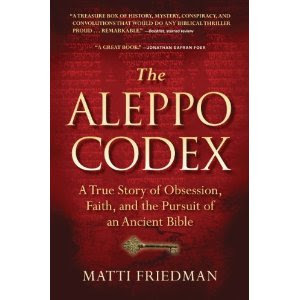 Based on Matti Friedman’s independent research, documents kept secret for fifty years, and personal interviews with key players, the book proposes a new theory of what happened when the codex left Aleppo, Syria, in the late 1940s and eventually surfaced in Jerusalem, mysteriously incomplete. The codex provides vital keys to reading biblical texts. By recounting its history, Friedman explores the once vibrant Jewish communities in Islamic lands and follows the thread into the present, uncovering difficult truths about how the manuscript was taken to Israel and how its most important pages went missing. Along the way, he raises critical questions about who owns historical treasures and the role of myth and legend in the creation of a nation. Out on 15 May. Buy here. Griesbach, Westcott, Hort, Buttmann, Lachmann, Scrivener, Tregelles, Swete, Brooke, McLean, Thackeray ... Do these names sound familiar? Eisenbrauns is currently offering 20% off on titles by these authors in the Cambridge Library Collection. The Cambridge Library Collection has a wealth of classic textual critical and other 19th century resources in it. We are looking for enthusiastic candidates with a Master’s degree or equivalent, in a (sub)discipline of religious studies or theology, or not-too-far-advanced PhD candidates. Candidates with a degree in Biblical Studies, early Jewish Studies, Ancient Near Eastern Studies, or Ancient History are encouraged to apply. The degree must have been obtained within a reasonable period of time and with results that justify the expectation that the student will be able to successfully complete the programme within four years. Admission depends also on the quality of your research proposal. An excellent command of spoken and written English is essential. Bart Ehrman has started a blog - CIA. I don't know what he says because you have to pay $24.95 for the privilege. Over at Hypotyposeis, Stephen Carlson gives a synopsis of his Duke University Dissertation on the text of Galatians. This dissertation investigates the text of Paul’s Epistle to the Galatians and its history, how it changed over time. This dissertation performs a stemmatic analysis of 92 witnesses to the text of Galatians, using cladistic methods developed by computational biologists, to construct an unoriented stemma of the textual tradition. The stemma is then oriented based on the internal evidence of textual variants. After the stemma is oriented, the textual variants near the base of the stemma are examined and the text of Galatians is established based on stemmatic and eclectic principles. In addition, two branches of the textual tradition, the Western and the Eastern-Byzantine, are studied to assess the nature of textual variation in their history. This study reaches the conclusion that a modified stemmatic approach is an effective way to study both the text of a New Testament book and its history. Hopefully this will soon be available at DukeSpace. His thesis title was "The Text of Galatians and Its History". Those of you who know Stephen's work will not be surprised to hear that his thesis was outstanding, and his defense of it exemplary. If we awarded "honors" here at Duke, or "graduation with distinction", this thesis would have received that award. Very many congratulations, Stephen, on a richly deserved PhD, and all the very best for your future! Description: Textual criticism is in a period of change, as it seeks to account for an ever-growing body of textual data as well as the development of new methodologies. 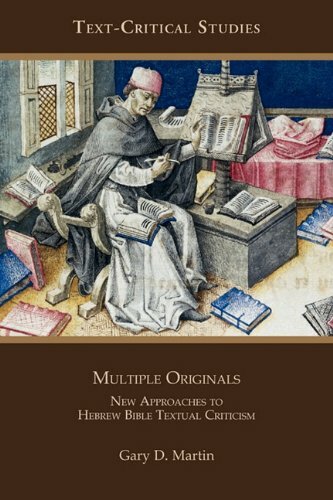 Since the older methodologies cannot simply be modified to meet our present needs, Multiple Originals seeks to build bridges between methods of traditional textual criticism and those of orality and formulaic analysis. Examining practices of textual criticism across a wide range of texts and disciplines, this book challenges the assumption that there can be only one correct reading and argues for the presence of multivalences of both meaning and text. It demonstrates that in some cases multivalences were intended by the composer, while in other cases, during the periods from which our earliest extant manuscripts derive, they fell within the limits of variability acceptable to those who valued and transmitted those texts. 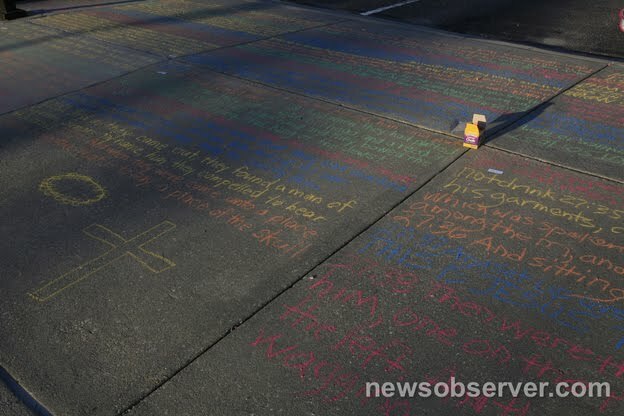 Handwritten New Testament (in chalk)! I defended my dissertation, "A Critical Edition of the Hexaplaric Fragments of Job 22-42", this morning at Southern Seminary in Louisville, KY. It's a critical edition in the sense that it incorporated all of the available evidence of Origen's Hexapla for Job 22-42, and I evaluated that evidence by deciding the original text and listing all variants in an apparatus. In most cases critical notes on the text are provided. I want to thank Peter Gentry and Jim Hamilton for serving on my dissertation committee as well as Claude Cox and Jerome Lund for serving in the capacity of external examiners. Check out this slideshow with selected items (including P39) from the Green Collection published on the webpage of Foxnews. More on the current exhibit, Verbum Domini, in the Vatican on CBN news recently. Article on "Scribal Hermeneutics in the Longer Ending of Mark"
"Discipleship after the Resurrection: Scribal Hermeneutics in the Longer Ending of Mark" by Suzanne Watts Henderson, Queens University of Charlotte, NC. Scholars typically maintain that the Longer Ending (LE) of Mark subverts Mark’s somber message about Jesus’ sacrificial death with a triumphant, concluding vision of the risen Lord seated at the right hand of God (Mark 16:19). This study takes a different tack, promoting a more nuanced understanding of the relationship between Mark and the LE by detecting important thematic elements—especially concerning discipleship—that the later passage both adopts and adapts from its host gospel. For the writer(s) of the LE, the resurrection serves less as a dividing-line between Jesus’ disciples and Mark’s community and more as the bridge that confirms emphatically the new age of God’s reign, evident both before and after the passion through those who trust the message of that good news. A new online journal has been launched, Biblical and Ancient Greek Linguistics (BAGL). Biblical and Ancient Greek Linguistics (BAGL), in conjunction with the Centre for Biblical Linguistics, Translation, and Exegesis at McMaster Divinity College and the OpenText.org project (www.opentext.org) is a fully refereed on-line and print journal specializing in widely disseminating the latest advances in linguistic study of ancient and biblical Greek. Under the senior editorship of Professor Dr. Stanley E. Porter and Dr. Matthew Brook O'Donnell, along with its assistant editors and editorial board, BAGL looks to publish significant work that advances knowledge of ancient Greek through the utilization of modern linguistic methods. Accepted pieces are in the first instance posted on-line in page-consistent pdf format, and then (except for reviews) are published in print form each volume year. This format ensures timely posting of the most recent work in Greek linguistics with consistently referencable articles then available in permanent print form. More about the scope of the journal here. So far, two articles have been published in volume 1. The on-line images of Codex Bezae (mentioned already here) are very good. One of the particular difficulties in dealing with and imaging Bezae is the extreme thinness of the parchment (mentioned briefly in Parker, Codex Bezae, 22f). This means that quite often bleed-through from the other side of a page makes reading difficult, and checking readings in the manuscript itself often involves checking both sides of the leaf. The new images (unlike the old facsimile) seem to have been taken in such a manner that minimises this bleed-through from the other side (although I couldn't find any discussion of imaging issues on the web-site and we should note that imaging always involves some level of interpretation/manipulation of the data, see here for an interesting recent discussion). The parallel to the left of the upright is from the other side. Bezae has a normal gamma, EIS GHN ISRAEL (one can also check this by comparing all the gammas and taus on this page). In a recent article in Zeitschrift für die Neutestamentliche Wissenschaft, ZNW 103 (2012, pp. 64-83), Benjamin J. Burkholder is "Considering the Possibility of a Theological Corruption in Joh 1,18 in Light of its Early Reception". Citing Fenton J.A. Hort as a motto - "The always questionable suggestion of dogmatic alteration is peculiarly out of place here”, which has been challenged most notably by Bart D. Ehrman - he finally draws the conclusion that "when μονογενὴς θεός does become a litmus test for orthodoxy, it occurs at such a late date that it cannot aid in determining how the reading came into existence ... the extant evidence from early Alexandria does not provide any conclusive evidence that the variant in Joh 1,18 would have arisen from theological motives... the evidence suggests that a theological corruption is an unlikely explanation for the extant readings of Joh 1,18" (p.83). The H. Milton Haggard Center for New Testament Textual Criticism (CNTTS) is pleased to announce the donation by Dr. Glen L. Thompson of part of his collection, with the donation including 78 volumes in the fields of papyrology and textual criticism. Professor Thompson has served as professor of history at Wisconsin Lutheran College since 2002, and is currently teaching at Asia Lutheran College in Hong Kong. The Thompson Collection includes an impressive number of works on papyrological topics such as Coptic and Demotic linguistics and papyrology. In the process of assessing the value of the library, CNTTS’ Scholar-in-Residence James M. Leonard discovered that about half of the collection consists of books no longer available at major book vendors or even in the extensive holdings of major specialist libraries such as Tyndale House, Cambridge. Dr. Bill Warren, the CNTTS Director and Landrum P. Leavell II Professor of New Testament and Greek, noted, “This thoughtful donation by Glen Thompson is a prime example of the type of attitude and action that will keep our field moving forward by enhancing the research options both for those here and for visiting scholars and students.” This is the second substantial library donation to CNTTS in the past year, the first being the Gordon D. Fee Collection. The Thompson Collection will be a part of the Seminary’s John T. Christian Library which contains about 250,000 bound volumes, the largest theological library in the Gulf Coast region of North America with about 250,000 bound volumes. The collection will be housed at the CNTTS and available for use onsite by researchers and visiting scholars. CNTTS is located at New Orleans Baptist Theological Seminary, one of the five largest accredited seminaries in North America. Currently, 10 full-time and part-time researchers are employed at CNTTS, with 4 PhD students working on dissertations in New Testament textual studies.